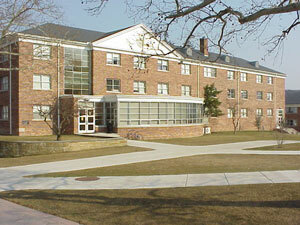 Juniata College offers lodging for summer guests in our eight residence halls. While availability varies throughout the summer months, we’re sure you’ll find our rooms comfortable and economical in the campus market. Single and double rooms are available in each building. Our community living environment with common bathrooms and lounges will allow your guests to build closer camaraderie. Additionally, residence hall living is a great resource for organizations that require group projects or team building during their conferences and camps. To view our lodging options, please visit our housing website: https://www.juniata.edu/offices/res-life/res-halls/index.php. We apologize that off-campus housing options are not available for camp and conference groups. For more information about the residence halls and summer availability, please contact us. While we will attempt to house groups in their first choice of housing, maintenance schedules and other activities may require alternate accommodations. Baker Guest House is also available for lodging individuals or small groups. Please visit the Baker Guest House page for more information.